With dough of your choice (we used wheat, but I'm planning on trying it on white), separate three sections. Flatten into wide, somewhat oblong rectangles. I used a combination of hands and rolling pin. They were each about 5 inches by 9 inches and around 1/4 inch thick. 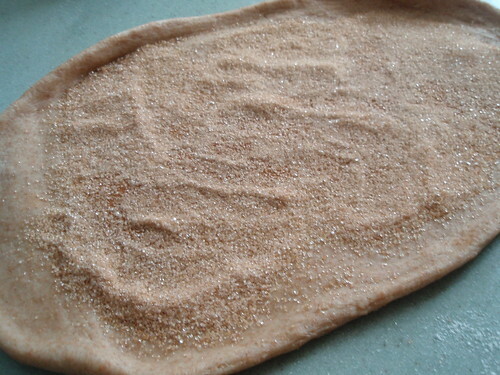 Sprinkle with mixture of 1/2 c sugar and 2 1/2 tsp cinnamon. You could also add chopped almonds or a dash of nutmeg. Avoid the edges on all sides. Roll together like a cinnamon roll. I didn't roll in the short edges, just pinched them shut. But you could fold them in to prevent cinnamon oozing out... but that's some of my favorite part. Repeat for other two rolls. 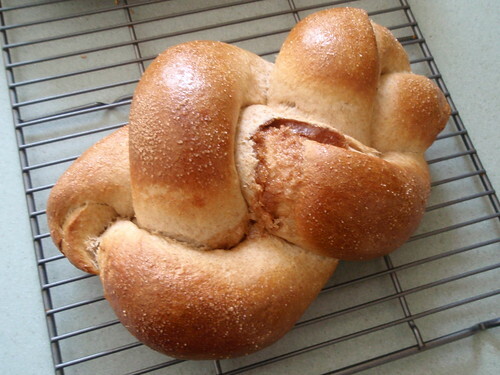 Braid as normal challah. Sprinkle with any left over cinnamon sugar after egg wash.
Pre-egg wash. 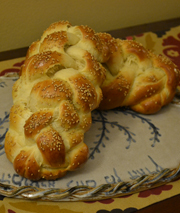 Try to keep the seams of the braids DOWN (against the rest of the bread). Bake at 350 for 30-40 minutes. (I'm sorry all of my oven times are so imprecise... our oven runs cool so I actually have to bake everything at 365 and pretend is 350 because that's the real temperature). 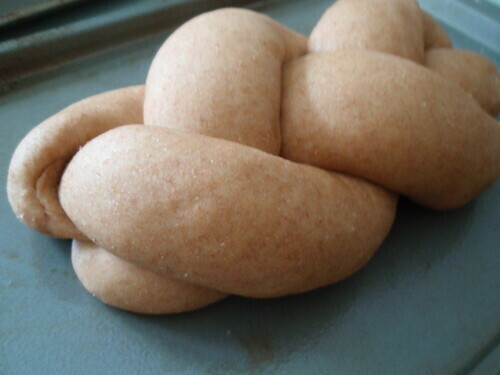 Don't worry if the braids break open; it'll still be delicious!